Welcome back to Pocket Reviews, reviews of games that fit in your pocket. I recently attended DPX, the Directly Play Expo, here in Edmonton. In addition to having a lot of fun, I also got to see my Boss, Dave Chapman, and get my “pay”: a bag full of games to review! While I was looking through my choices, I noticed a game called Penk. But the box was written entirely in Italian. Ooh, a challenge! It may not be obvious at first glance, but I am very stubborn, and I take a good challenge all the way to the finish. [Editior’s Note: it is very much obvious, even at first glance. -dc] Now, I have one Italian Facebook friend, and I have discovered that it is sometimes possible to extrapolate Italian from French. Puzzling out a few words: “dadi” for dice, “lancio” for throw, and of course “combinazioni” for combinations let me figure out that this was essentially a Yahtzee variant. But reading the instruction booklet was way beyond my skill level. The first thing I did was grab my phone and look up the publisher, Cranio Creations, where I found a demonstration video, in English. It is a good introduction but still left me with unanswered questions. Dave left me a note on the box “English on BGG”; BGG was BoardGameGeek.com, where I found a pdf of the English instructions. I will warn you that you need to register with the site before you are allowed to download any of their files. I highly recommend downloading before you try to play. The translation is extremely useful, including several details that the creator of the video had forgotten to mention, such as how to correctly use the “jolly joker” and what happens when you can’t score. Wait a minute, jokers in a dice game? Now would be a good time to start talking about the game itself. 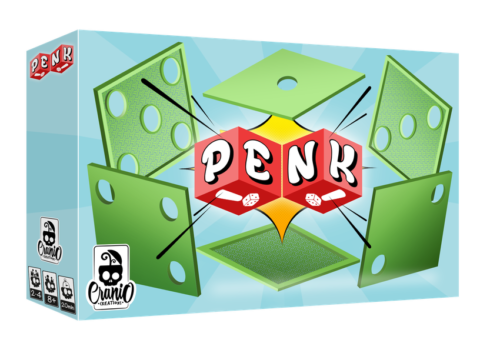 As I already mentioned, Penk is a Yahtzee style “throw and score” game, but there are major differences in gameplay. The first and most obvious change is the dice themselves. There are six of them, but each one only counts from one to five. That’s because the sixth side is the wild, represented by an exclamation point. There are limits on how you can use the wilds, which I’ll talk about later. The second big difference is scoring: there are a lot fewer combinations to try for; no full house or straights, and no big bonus for getting the same number on all the dice. You are looking for one, two, three, four and five of a kind for each number. So why have six dice when there is no six of a kind? That’s because, on each turn, you can fill in up to three score boxes. The final big change is the competition factor; this is a head to head game, where you need to be aware of your score, and your opponent’s. That’s because as soon as one player gets a Penk, by filling in a whole row or column (for example all the triples or all threes) none of the other players are allowed to play that combo again. They must cross out any squares that they haven’t filled in. And the penalty for not being able to score is a lot more severe too. In Yahtzee, if you can’t score, you fill one box with a zero. Here, if you can’t score, you must cross out a whole column (for example, all the threes that haven’t been scored yet). Even worse, if anyone fills two columns, either by scoring or crossing out, the game is over. The game is fairly simple, once you understand the rules. The game can be played by two to four players; decide who is playing first, and that person marks off the red exclamation point on their scorecard. Start by rolling all six dice; you can reroll twice, keeping any numbers (or wilds) you want. Then arrange the dice into up to three sets. You can use the wilds, but only one wild per set, and you cannot use the wilds alone. For example, 5-5-! can be scored as a triple, but 5-!-! cannot, and !-! cannot be used as a random pair. Circle the number(s) on your scorecard. It is now the next player’s turn. Scoring at the end is a little bit complicated, but not too bad. First of all, you only get points for a row or a column if you scored at least three times. Otherwise, you automatically get zero. You add up the circled numbers to get a total for each column and row. Then you add all those numbers to get the grand total. The first game my friend and I tried went quite quickly. It didn’t take long for me to explain the rules, and it soon turned into learning by doing. It was fun seeing the grin on my friend’s face when she Penked for the first time. The biggest issue is paying attention to what you need and don’t need, so you don’t waste dice. Another problem is that it is very tempting to just take pairs and triples at the beginning, because it is exciting to fill in multiple boxes at a time. But this means, near the end, you are stuck trying for four- and five-of-a-kind. Because of the two full columns rule, the end of the game can come quite unexpectedly, but it is easy to just start a new game. As with all pencil and paper games, don’t forget to set aside one clean copy of the score sheet for photocopying.